The continued working efficiency of this gigantic enterprise is a matter for national congratulation, and the fact that it has now for some months withstood all difficulties may, we hope, be accepted as a guarantee that this great achievement—the scientific event of the past year—may be regarded as a permanent success. Under these circumstances we are induced to lay before our readers some particulars regarding its construction which cannot fail to be of special interest, evidencing as they do, a union of the most consummate experimental skill with the highest form of its practical development. It is not our purpose to theorise as to the causes of the failure of the two former schemes; enough to know that they did not succeed; but the accompanying diagrams, and tabular description, will sufficiently explain the motif of the different systems, and furnish data for comparison in all the essential points of their construction. To enter at once upon our immediate subject, the description of the manufacture of the cable of 1866. So far as the materials are concerned, the cable owes its existence to the skill and enterprise of Birmingham manufacturers, and the industry of Birmingham workmen. Four things were required for the material of the cable—copper wire, gutta-percha, iron wire, and stout Manilla yarn. The copper wire was manufactured by Messrs Wilkes and Co., and Messrs Bolton and Sons, both of Birmingham; and the iron wire was produced by Messrs Webster and Horsfall at their works, Hay Mills, Birmingham, from homogeneous iron made at their works at Killamarsh, near Sheffield. The Manilla yarn was spun by Messrs John and Edwin Wright, of the Universe Works, Garrison Street, Birmingham, and Millwall, London. And, finally, the combined materials, copper, iron, gutta-percha, and Manilla yarn, were put together under a telegraph construction patent, taken out by Messrs Wright, the Construction Company at Greenwich being their licensees. In most respects the present cable closely resembles that which was partly laid last year. The conductor is formed of seven copper wires (six laid round one), each wire being separately embedded in “Chatterton’s Compound,” the whole being equal to a single wire of No 10 gauge, and weighing 300 lbs per nautical mile. The copper strand is enclosed in gutta-percha, the best known insulator, applied by successive coatings until the “core” is about half an inch in thickness. Lest its own weight should bring defeat and woe. The cable in its finished state, measures about an inch and a half in diameter, weighs 31 cwt. per nautical mile in air, and 14¾ cwt in water; being able to endure a breaking strain of 8 tons 2 cwt. or equal to eleven times its weight in water;—that is, the cable will bear its own weight in eleven miles depth of water. As the deepest water to be encountered is 2,400 fathoms, or less than 2½ nautical miles, the provision thus made was ample. In all the points above mentioned, the new cable resembles the old one. It differs in two respects—the strengthening wires are galvanised, and the yarn is left white instead of being tarred; the latter change having been made partly to decrease the weight of the cable, and partly to facilitate the discovery of any foreign substances, some of which proved so troublesome in the process of “paying out” the old cable. In the mere material of iron wire for the new cable, something like 20,000 miles were supplied, and a proportionate quantity of copper wire;—in themselves no inconsiderable item;—and this was consigned to the gutta-percha works of the Telegraph Construction and Maintenance Company, City Road, London, which are under the management of Mr Chatterton, whose name has been already mentioned. The gutta-percha has, however, to go through a vast amount of preparation before it can be applied to its destined use; that intended for telegraphic purposes being subjected to processes far more complex than is needful for ordinary work, and each requiring the most scrupulous care. The large blocks have first to be broken up, then reduced to chips, and boiled in huge cauldrons. Next it is plunged into cold water, and all impurity removed, so far as practicable. This is succeeded by another boiling, and the application of powerful hydraulic pressure, while the next process renders it tenacious and plastic, and when it becomes eventually reduced to a semi-fluid condition it is ready for use. In the upper floor of the Company’s works is a “testing room.” Here the copper wire, as received from Birmingham, had to be tested electrically, to determine its quality as a conducting medium, and to detect any flaw in its manufacture. Having gone through the testing room, the wire was first passed through Chatterton’s compound, wire by wire; and then the central wire was conducted up a vertical spindle, round which were arranged six bobbins, containing additional supplies of wire. The action of this machine (identical in principle with that used for wire rope making) winds these six wires round the central one; and thus was produced a circular (or nearly circular) strand, forming the conductor—the very heart and pith of the whole enterprise. The seven wires act, in reality, as a single conductor; but m the event of even six of them failing, or becoming injured, it would still be possible to transmit messages along the single remaining wire. The copper strand completed and tested, the process of covering it with gutta percha—the insulating medium—was proceeded with. The strand having first passed through Chatterton’s compound, was prepared to receive and retain the first coating of gutta percha, imparted to it by running the wire through the gutta percha in a state of solution. Thence it was conducted through cold water, and afterwards carefully tested by an electrician, to see that its conducting power remained uninjured. The testing over, the process just described was repeated,—first a layer of Chatterton’s compound, then a layer of gutta percha, then cooling in cold water, then the application of electrical tests. These processes were repeated until the coating of gutta percha became of the necessary thickness,—thus completing the “core.” When the core was finished, it was again submitted to electrical tests, and perfected; after which it was wound round drums in lengths of something more than 2,000 yards, and immersed in tanks of water, kept at an uniform temperature of 75 degrees of Fahrenheit. During this stage electrical tests were constantly applied; and the fact that these were satisfactorily borne at the above-mentioned temperature was held to establish the capacity of the cable to endure any similar conditions to which it can possibly be subjected. From the gutta percha works, the “core,” taken out of the tanks as wanted, and coiled upon larger drums containing from 4,000 to 5,000 yards, had to be transferred from the City Road to the extensive factory premises of Messrs J. & E. Wright, at Millwall, Poplar, where the whole of the yarn required for the cable was prepared under a marvellous system of energy, skill, and rapidity; some idea of which may be gathered from the facts we have now to mention. From first to last everything connected with the manufacture of the cable may be strictly said to have been effected by machinery. From the sorting of the hemp to the completion of the finished yarn, there was nothing but machine-work. The great object in view was, of course, to economise time and labour; and, while reducing the cost of production, to improve the quality of the work. An engine of eighty-horse power was employed to direct and control the machinery, and the twine-yard itself is a building especially adapted for so vast an undertaking; being a broad, excellently-lighted shed; very lofty, very long, clean, whitewashed from floor to ceiling, healthy, and well ventilated. The whole of this space was occupied with various machines, for heckling, lapping, spreading, or spinning, as the case may be; the wheels and straps, with every projecting portion, being carefully fenced or boxed, as a safeguard against accidents. Spinning yarn by machinery is of comparatively recent introduction; and but for this aid, the manufacture of the yarn for the cable would have been an impossibility in anything like the time in which it was actually accomplished. A few figures will render this statement clear, and the following details will be examined with interest. 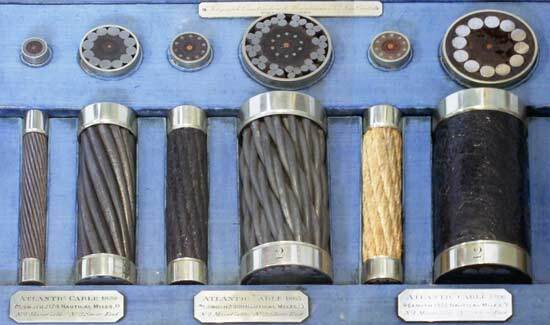 From the works at Greenwich the cable was manufactured at the rate of twenty miles a day, or 120 miles per week. To make this quantity there was required every day 200 miles of Messrs. Webster and Horsfall’s wire, and not less than 1,000 miles of Messrs Wright’s Manilla yarn. As a matter of curiosity, the work of one day of twenty-four hours was measured out into yards, and some idea of the power, speed, and extent of the machinery employed, may be acquired from the fact that one day’s production, resulted in the almost incredible length of 3,053,020 yards. Thus, in twenty-five days, Messrs Wright turned out from their factory at Millwall yarn enough to encircle the entire globe; with a thousand miles or so to wrap over and tie the gigantic skein into a safe knot! To this general summary it may be worthwhile to add a more analysed description of the complex and ingenious method of yarn-spinning itself. The first part of the process consists in cutting the clean hemp into shortish lengths; for the reason that, it the full length of the fibre were used, the yarn could not be spun fine enough for general purposes. The cutting accomplished, the hemp is what is technically called “heckled;” that is, the fibres are thrown by hand lightly upon the ends of sharply pointed steel pins, 9 or 10 inches long, fixed in rows on a board or stock, round a heckle. This operation is repeated until the fibres are perfectly separated, and lie parallel to each other. Next the hemp is taken to a machine called a “lapper,”—an ingenious arrangement of rollers connected with a large central drum or cylinder, all closely studded with steel points, or “heckle pins.” The hemp passes through and over these pins, by which it is further trimmed and separated, and reduced to a complete uniformity of texture. Ultimately, by an ingenious contrivance, which cannot be explained without drawings, it is wound, or “lapped” on to the central drum. When a “lap” of about 6 or 7 lbs weight has been thus dealt with, the hemp is found to be extended to a length of about 19 feet; and the workman next takes it to a “spreading” machine, to be made into a continuous flat ribbon or “sliver.” This operation concluded, the “slivers” are delivered, by means of a complicated but thoroughly efficient system of rollers and “heckling” boards, into large tin cans placed at the end of the machine. Thence they are taken to another machine, and subjected to a process which gives them still greater evenness and firmness. A third machine, of much the same character, carries the work a step further. Arrived at the spinning-frames, the carefully-prepared fibre once more passes through a series of rollers and heckles, until it reaches what are technically called the “delivering” rollers, where the process of spinning, properly so called, actually begins. Being by this reduced to the size, fineness, and consistency required for spinning, the “sliver” now passes over the roller on a curved and polished metal plate, with an angular groove, fitted to receive the thread. Immediately below the grooved plate is placed the “fly” or bobbin frame, and through an opening in this frame the thread passes downwards on to a bobbin, or large reel, placed within the “fly.” This rests upon a “drag-plate,” so that when the motion is imparted to the “fly,” the bobbin revolves with it. A spring, pressing upon the “drag,” forces it to take up the thread as it is being delivered from the roller, and at the same time the twist in the thread runs up through the top of the “fly” to the grooved plate before-mentioned. Thus the delivering, twisting, and “taking up,” proceeds continuously till the bobbin is filled. When this is accomplished, by the touching of a spring at the neck of the “fly,” which is thus brought forward, the full bobbin is released, and replaced by an empty one, when the work goes on again just as before. The manufactured article is then shifted into the winding-shed, where it is transferred to huge drums, for the sake of stowage, and is thence again wound off upon large bobbins, each holding about four miles of yarn. From the factory at Millwall the cable passed to the works of the Telegraph Company, situate on the other side of the river, a short distance below Greenwich, at a spot called Enderby’s wharf. Here is a large covered area fitted from end to end with longitudinal iron frames, within which were made to revolve the innumerable bobbins filled with yarn recently spun at Millwall. The huge coils of wire, received from Birmingham, were here stacked, in readiness to be subjected to the operation of being covered with yarn. The wire passing through a spindle in each of the longitudinal iron frames receives from the bobbins its due proportion of yarn; and eventually the wire appears enclosed in five Manilla yarns, the whole forming a six-fold strand, with wire for the centre, and stout Manilla yarn for the outside, as shewn in our diagram, No 3. This preparatory process being accomplished the cargo was moved onward to Morden’s wharf, where the final touch was given to the cable. First the “core” itself, which was sent thither direct from the gutta percha works, had to be “served,” or coated with ordinary hemp, closely spun round it. Tho object of this was to form a further protection for the core, and also to act as a bed for the strengthening iron wire, after receiving its yarn coating at Enderby s Wharf. 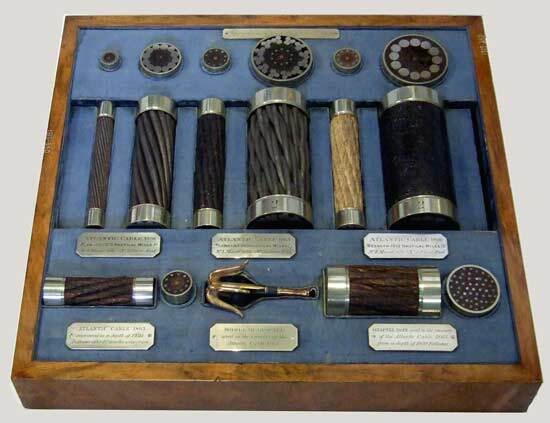 When “served” with yarn, the half-finished cable was plunged for about sixteen hours into cold water; and during this period—as, indeed, throughout the process of manufacture -electric tests were constantly applied, and the slightest fault carefully repaired immediately on its detection. The tank-house, in which this submersion was effected, occupies a large area, as may be gathered from the fact that thirty-two immense vats were there stored, each capable of holding two miles of cable. Having gone through the bath, and been subjected to the various tests, the cable received its final covering of ten iron wires, each well protected by its fivefold Manilla coating. This process the “closing,” was effected by machines identical in principle with those used in the manufacture of wire rope. A number of bobbins, supplied with the coated wire, having been fixed in a circular revolving iron frame, the “core,” with its “serving” of yarn was made to pass through a hollow spindle, rotating rapidly; while, in its revolution, the ten strands of yarn and wire being gradually tapered up to the head of the machine, were there, by an ingenious mechanical arrangement, twisted round the inner circle which they are destined to protect. Thus was completed the manufacture; all that remained to be done being to pass the cable through another system of tanks, where it was once more subjected to electrical tests, and then “paid off” gradually into the hulks, provided to convey it to its ultimate destination in the enormous tanks on board the Great Eastern. The Scientific Committee appointed by the Directors of the Atlantic Telegraph Company to examine all specimens submitted to the Company, were Captain Douglas Galton, R.E. ; Messrs. Fairbairn, C.E. ; C. Wheatstone, F.R.S. ; W. Thomson, LL.D. ; and Joseph Whitworth, C.E. ; who unanimously recommended that the compound hemp and wire cable should be adopted. The subjoined diagrams and table, already referred to, will serve as a summary of the above description, and also supply some additional information. 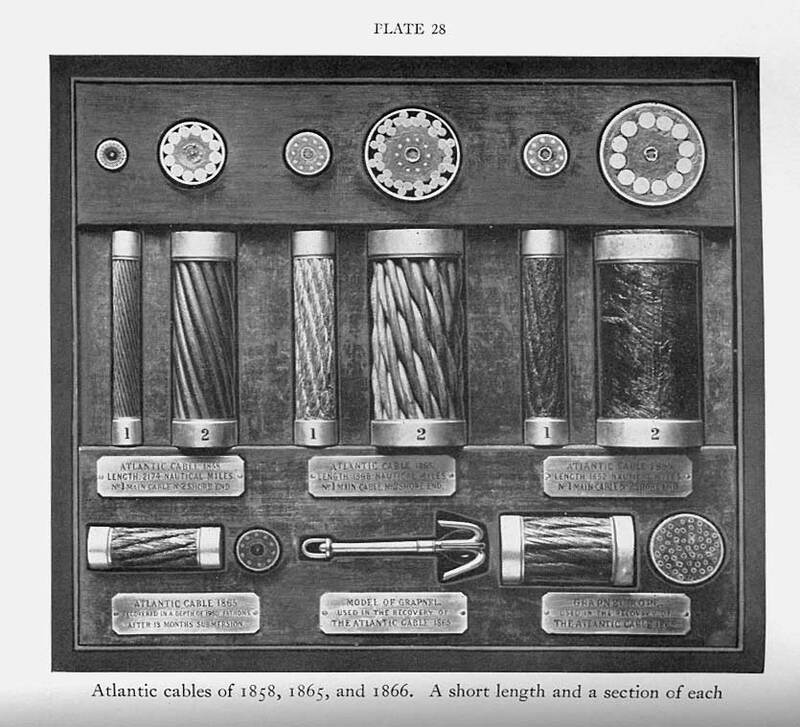 Descriptions respectively of the Cable submerged between Ireland and Newfoundland by the Atlantic, Telegraph Company in 1858, and of the Cables manufactured for the same Company by the Telegraph Construction and Maintenance Company, Limited, in 1865 and 1866. Conductor—A copper strand, consisting of 7 wires (6 laid round one), and weighing 107 lbs per nautical mile. Insulator—Gutta Percha laid on in three coverings and weighing 261 lbs per knot. External Protection—18 strands of charcoal iron wire, each strand composed of 7 wires (6 laid round one ), laid spirally round the core, which latter was previously padded with a serving of hemp saturated with a tar mixture. The separate wires were each 22 ½ gauge, the strand complete was No 14 gauge. Conductor—Copper strand consisting of 7 wires (6 laid round one) and weighing 300 lbs per nautical mile, embedded for solidity in Chatterton’s Compound. Gauge of single wire .048 = ordinary 18 gauge. Gauge of strand .144 = ordinary No. 10 gauge. External Protection—Compound hemp and wire. Invented and patented by John and Edwin Wright, Universe works, London and Birmingham. Ten solid wires of the gauge .095, (No. 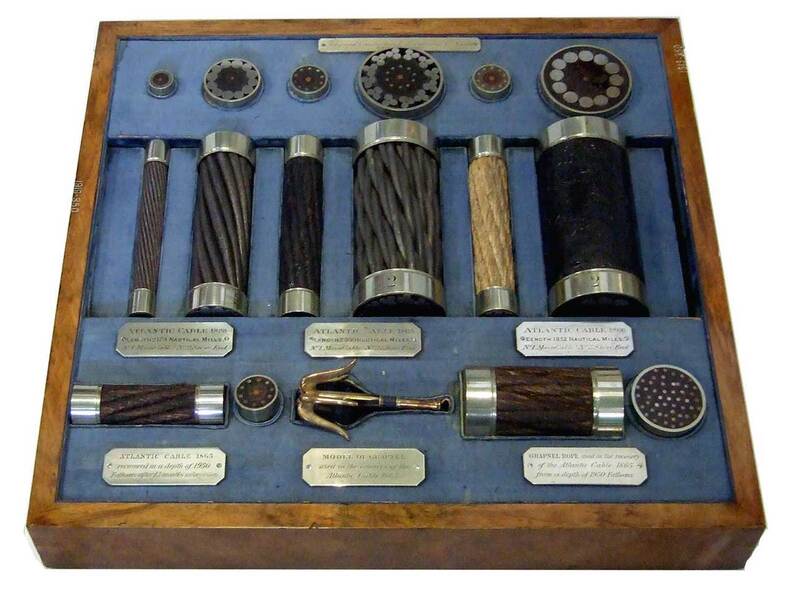 13 gauge) drawn from Webster and Horsfall’s Homogeneous iron, each wire surrounded separately with five strands of Manilla yarn, saturated with a preservative compound, and the whole laid spirally round the core, which latter is padded with jute yarn, saturated with preservative mixture. Conductor—Copper strand consisting of 7 wires (6 laid round one), and weighing 300 lbs per nautical mile, embedded for solidity in Chatterton’s Compound. Gauge of single wire .048 = ordinary 18 gauge. Gauge of strand .144 = ordinary No 10 gauge. These images of a cable cabinet in the collection of the Science Museum, London, show further details of the construction of the three cables.